After a large project I inevitably have plenty of "scrap" wood around. Like most woodworkers, I HATE to throw away any wood, so I often use it for small projects instead. 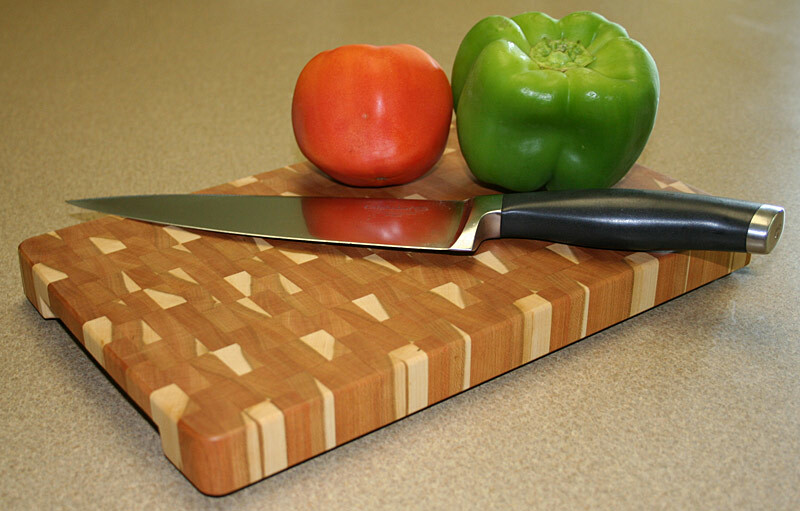 Here is a good example of what I often do with "scrap" wood - a cutting board. I've made several of these over the years. 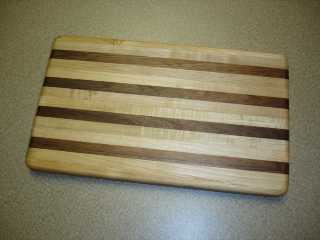 The one pictured above if made with maple and walnut because that's what I had left over. You can choose many hardwoods as long as they're relatively hard (e.g. poplar would not be a great choice) and closed pored for sanitation (that rules out red oak and others). Walnut and maple make a great combination. The finish on these pieces is about as easy as it gets. Just wipe on a liberal coat of mineral oil or two and it's good to go. 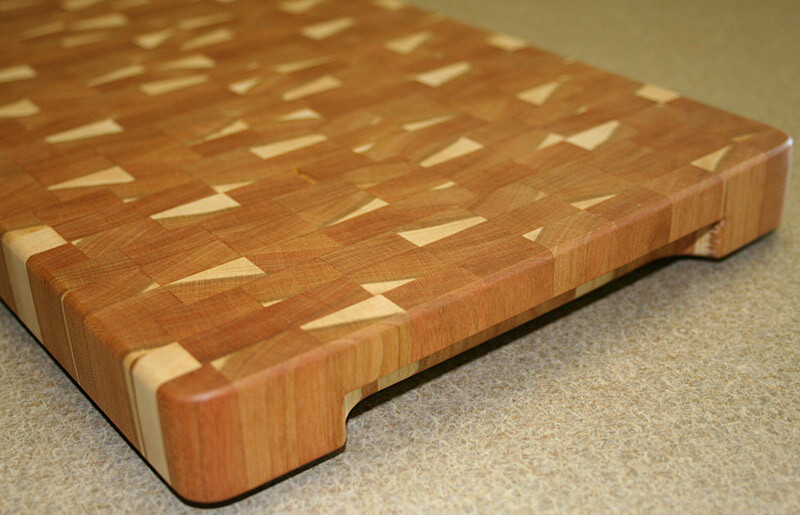 As the surface wears from use you can occasionally re-apply the mineral oil to revitalize the surface. Update 2004: Here are a few more I recently completed out of maple and walnut "scraps". 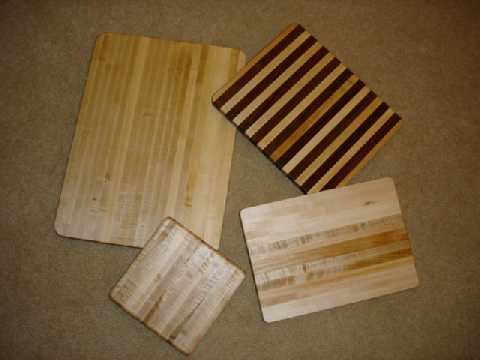 Sizes of these boards range from about 8"x8" to 15"x19". Update Oct 2005: After completing my new bench I had a bunch of 8/4 hard maple offcuts left over. There's no better wood than hard maple for cutting boards so I made up a couple thick ones. They both have routed juice slots and handles on the ends. 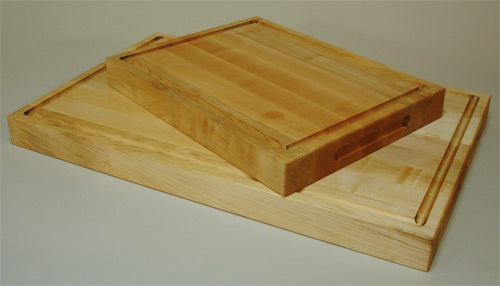 Sizes are 11"x15" and 14"x23", both 1-3/4" thick. 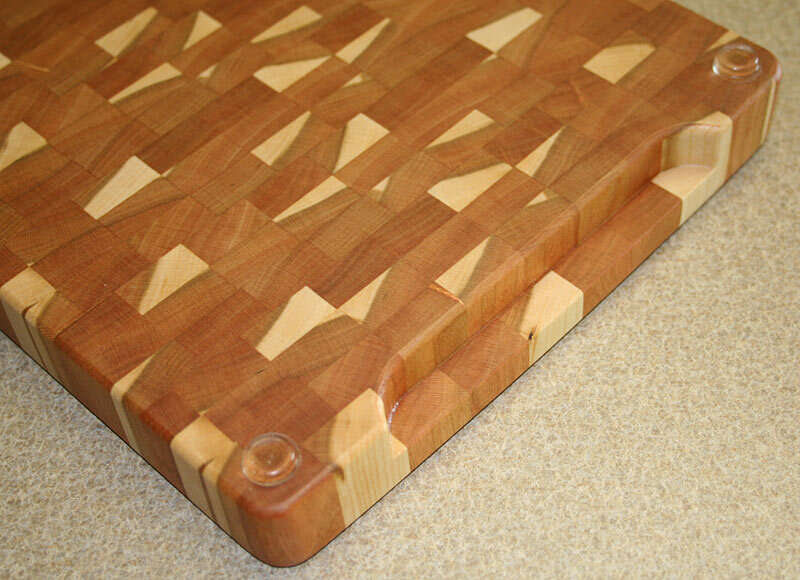 Update Jul 2009: this is my first end grain board. Pretty neat - I'll be making more for sure. This is from a twisty board full of sapwood - the worst of the bunch from a pile of log run cherry we purchased a few years back. I've been using the other sappy boards for secondary wood (drawer boxes, dust panels, etc) but I have a few boards that twisted too badly to be used for even that kind of stuff. So as an experiment I cut this board up into short sections (18"ish) and face-jointed and planed them flat. Even with boards that short they ended up being under 1/2" thick. 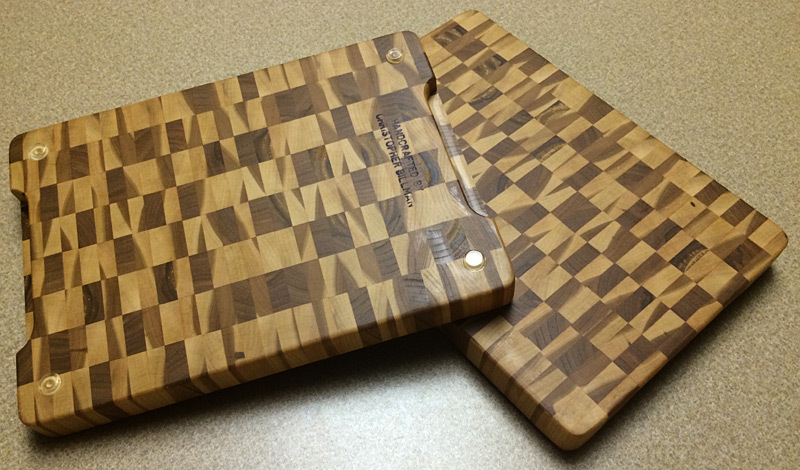 So I laminated a pile of them into this end grain cutting board. Worked out pretty well, and it's probably one of the best uses for these twisty boards. The board ended up a nice size: 12-1/4" x 7-3/4" x 1-1/16". Finish is a few coats of a mineral oil and paraffin (or maybe beeswax - can't recall which one I used) mixture heated to soak in. I routed two "handles" on the bottom side so that it's easy to pick up and added 4 rubber feet to keep it stable and ensure even air circulation around the end grain. Update Nov 2014: Couple more like the one above. From junky sappy cherry. 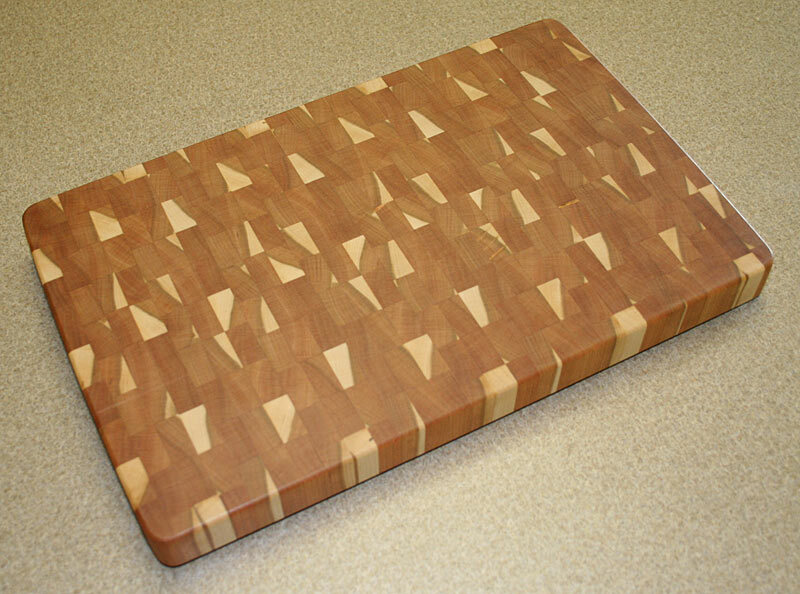 Makes a nice pattern for an end grain cutting board.